I guess it’s more like “Thufferin’ Thuccotash!” Poor ol’ putty tat. So when I recall my visit to Tasty n Sons in Portland, Oregon, I, for some reason, cannot help but think about Looney Tunes. Mind you, this has nothing to do with the food, service or atmosphere. I just somehow formed a connection in my brain between sufferin’ succotash and Shakshuka, a popular Middle Eastern breakfast dish. I first encountered Shakshuka at Tasty n Sons and promptly devoured the scrumptious combination of red pepper and tomato stew with baked eggs, and of course I added the optional merguez sausage, too. I knew Sylvester the Cat always exclaimed “Sufferin’ Succotash” in annoyance, but after researching the saying for this post, I learned the phrase is actually a euphemism of the phrase “Suffering Savior,” which was considered a profanity to certain religious types (see Looney Tunes is always teaching me). So just to be clear, I’m using this “profanity” in a positive way, as in, holy sufferin’ Shakshuka, that was good. And on to the bloody mary. 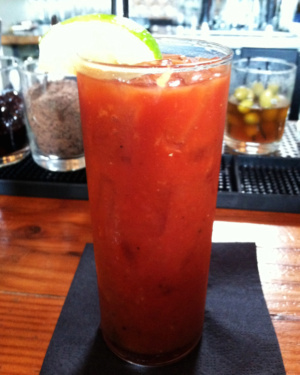 Tasty n Sons has a variety of interesting bloody mary options (check out The Garnish Gobbler’s recent visit). I chose the Dim Summore Mary, described as “monopolowa vodka, tomato, hoisin, lime, sriracha, ginger.” As one might guess, this is an Asian inspired bloody. It starts with tomato juice and vodka, which is a good starting point, but what makes it interesting is that the typical Worcestershire is replaced with hoisin and the Tabasco is replaced with Sriracha. The combination of hoisin and Sriracha not only worked well together but also worked well with the rest of the bloody mary. All the ingredients tasted of good quality and balanced nicely to make for a surprisingly refreshing drink. The drink was garnished with a lime and a piece of candied ginger (yum!) and made for a wonderful accompaniment to my Shakshuka. For creativity and taste, Tasty n Sons Dim Summore Mary earns 3.5 celery stalks (and I’ll have summore, please).